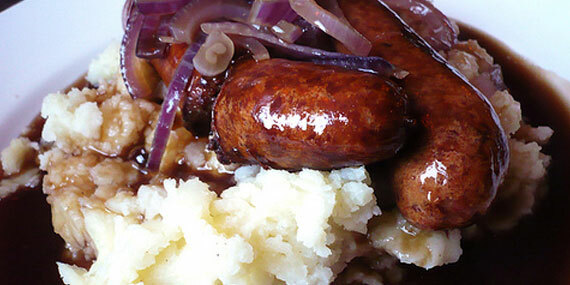 Mum’s cooking – can’t be beaten. 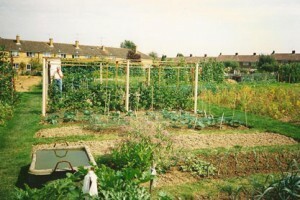 You are here: Home / Food Stories / Mum’s cooking – can’t be beaten. There have been times in my life when dinner was freshly-caught seafood eaten whilst watching the sun go down over the Caribbean. I’ve shared hot chilli-studded naan breads bought on railway platforms with fellow travellers on crowded Indian trains. I’ve had an exquisite truffle omelette cooked for me in an Italian village. And I’ve pondered which of the hundred or so local French cheeses to choose from a groaning cheese trolley in a posh private dining club. But none of it compares with eating goulash and a hunk of bread or bangers and mash at my mum’s kitchen table. Her cooking catapults me straight back to my childhood. I bought a tube of Vitapointe hair cream in the supermarket the other day, just for the nostalgic hell of it. Vitapointe used to be a ritual when we were kids, like a Haliborange vitamin tablet before setting off for school on a cold winter’s morning. 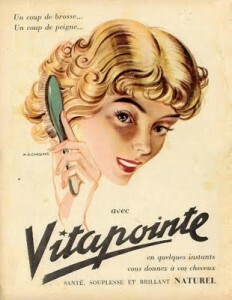 After our weekly hair wash our mum would dry our hair with her Pifco hair dryer and comb through a dab of Vitapointe so that our hair didn’t stick up on end. The hair dryer had a plastic casing the colour of an artificial limb and a thick white hose similar to the sort used to connect an astronaut’s helmet to their spacesuit. That connected to a bag that you put over your head, which freed up your hands so that you could sit and read while your hair dried. When the hair dryer was switched on the bag puffed up with hot air, swelling to give the impression that your head was a similar shape to Marge Simpson’s. As I considered the rather bland retro packaging sitting on the supermarket shelf I could almost visualise my mum setting about my younger brother’s just-washed Barnet with a comb and a small squeeze of Vitapointe, giving him a razor sharp side parting and a slick to the right. So what has a retro hair grooming product got to do with food? To be honest, I can’t think of a connection. But don’t worry, there’s food coming. I visited my mum recently, a belated Christmas / New Year / impending birthday catch-up. I walked through the back streets from the railway station wondering if she would have cooked one of my favourites for lunch. Like her baked meatloaf topped with a thick tomato sauce and served with creamed cabbage, or rolled brisket pot roasted with cloves. The streets hadn’t really changed much from my teenage years, when I’d hurry through them after a night hanging out in a bus shelter with my mates and a bottle of cider, ravenous from the alcohol, praying that there would be some leftovers I could raid the fridge for. The once identical terraces of council houses were now mostly privately owned and personalised with double-glazing, stone cladding and storm porches. It felt strange; as a teenager these narrow streets with their uneven paving slabs and wet muddy, grass verges had felt boring and uninspiring. Now they felt familiar and comforting as I made my way through the gloomy weather. I turned up the alley past the allotment where my dad once had a plot, then past the little parade of shops where we used to spend our school dinner money on chips or doughnuts making sure to leave enough for a packet of ten Players Number 6. Then down the hill, looking forward to getting back to the house I once couldn’t get away from soon enough. As ever, the back door wasn’t locked and I stepped into the warm kitchen. There were tantalising aromas hanging in the air. Casserole? Or was that chicken roasting? It was roasted chicken legs, which my mum served with boiled potatoes, a creamy, waxy fleshed variety called Vivaldi, along with red cabbage and green beans cooked the way her mother used to cook them. The perfect meal for a cold, wet January day. The beans were absolutely delicious, sweated in their own juices in a heavy pan for an hour and flavoured with onion and bohnenkraut ,a herb which my mum gets sent by her cousins in Germany. It’s known here as savoury but isn’t always easy to find. However, I’ve been given a few seeds to plant my own; I’ll let you know how that goes. No lunch at my mum’s is complete without dessert; we have my father’s sweet tooth to thank for that. Mum had made a gorgeous, Tarte aux Pommes Normande from an old Elizabeth David recipe, slices of sweet apple piled up on buttery pastry. New Year resolutions were put on hold as I demolished a thick wedge. It was when we got to the coffee and the After Eight mints that mum and I started getting nostalgic about confectionery. We could both remember when After Eight mints were new on the scene; the oblong green box of slim, square wafers of mint-filled dark chocolate in individual paper sleeves was considered a bit posh at the time. They were the sort of thing you might give as a special present. People sometimes brought them to dinner parties instead of a bottle of wine; much to the chagrin of a friend of mine who a) thought they tasted like toothpaste, and b) would much rather have had the wine. That then led onto a conversation about sweets you don’t see much these days, if at all. 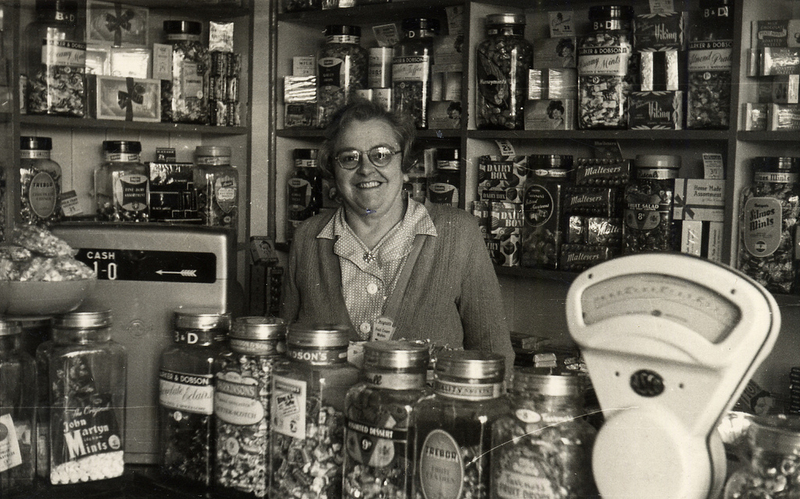 Which is where we’d like you to pitch in, with your memories of sweets you remember from years ago. We didn’t have many sweets when we were kids but sometimes a box was brought out as a treat after Sunday lunch. Usually it was Clarnico Mint Creams, sometimes Regency Candies, which I seem to remember had a candied orange jelly that everyone avoided. 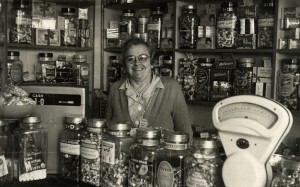 In those days the sweet shops always had large glass jars of sweets that you could buy by the ounce. Pear drops, cough candy and rhubarb and custards! Mum said that one of her favourites as a child was aniseed twists, and that lemon sherbets always left your tongue sore. I don’t suppose you can get sweet cigarettes, liquorice pipes or sweet tobacco, which was shredded coconut, anymore. We both agreed that sherbet fountains were brilliant, as were gobstoppers that changed colour as you sucked them, fruit salads, coconut mushrooms and four a penny shrimps. A tube of Smarties is still a big favourite. I could spend hours rattling off names – Spangles, all those different flavours, (I used to like the Old English), Pascall fruit bon bons, individually wrapped like little parcels, flying saucers and blackjacks. But why don’t you send us your memories of sweets you had as a kid? We’ll even try to think up some kind of a prize.